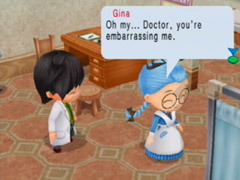 There aren't a whole lot of events that could be considered "random" compared to previous games in the Harvest Moon series. If you ignore someone for about a season you might see them in the morning, informing you that they're going away for a while. This typically always occurs with Basil once Winter arrives, but if you raise his affection up high enough he'll stay for the whole year. For other villagers you need you ship various things to get them to move back. This cooking utensil can be used to make Soda, Yogurt, Pickled goods, and even Deviled Eggs. 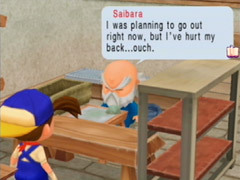 To receive this item, befriend Saibara until he has at least 1 heart. After that, visit his Atelier shop when he's inside. Saibara will let you know that he's been working on a plate for the Mayor. He wants to tell Theodore that it's completed but he's recently hurt his back and can't leave. If you agree to help then head over to Theodore's house to let him know about his plate. Theodore will reward you with the recipe for Potato Gratin, and when you return to Saibara he'll give you the Aging Pot for your help. After you get the Aging Pot, go visit Woody and he'll give you the recipe for Pickled Turnips. The last 5 slots of your rucksack can be unlocked by Martha. When she reaches 2 hearts, she'll begin to talk about how old your current rucksack is and how she can knit you a new one. Bring her some Yarn (any quality will do) and she will make you the 15 slot rucksack for free. Each of the 10 marriage candidates (excluding Jamie) have 1 rival-like event that you can view. Watching their event is just something extra to do in the game. The couples will never get married, and it has no impact on how you happen to be courting that person. Your rival must have 4 or more hearts, and the 2nd person in the couple must have less than 4 hearts. You just have to walk into the event locations to watch the scene between the two of them.